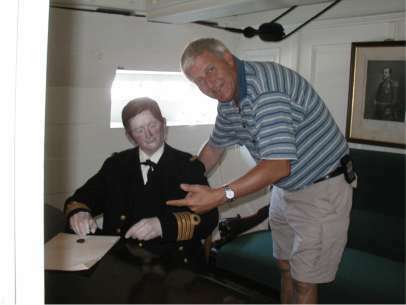 - Hallo, I am Johnny Erik Balsved, (born 1948) and I have appointed myself the Webmaster of this site, primarily covering the Royal Danish Naval history since 1510 and to the present day. Naval history has been the primary hobby for the most of my life. My special interests cover the period when the naval world changed from wooden hulls into steel, from sail into steam and from muzzle loaders to breech loading guns. Brought up by a father that spend most of his life in the merchant Navy as a radio operator. My own "naval career" started in November 1964, joining the Royal Danish Naval Quartermasters Corps. Realizing that we are all getting older, I have to admit that all the fine ships I have served on, have now been decommissioned for some years. The corvette OLFERT FISCHER is here spotted far away from home, in the Suez Canal, 1990. In 1977, I was appointed Lieutenant Commander in the Royal Danish Naval Home Guard and CO of Naval Home Guard Flotilla 365, Copenhagen. 1988, appointed Department Manager, and Commander of the Supply Section at Naval Base Copenhagen. During this period I also acted as the logistic coordinator for the Danish corvette OLFERT FISCHER (F355) during its station in the Persian Gulf 1990 - 1991. Later participating in the project groups dealing with the dismantling of the Naval Base. Reducing the more than 300 years old historical main base to a naval station and transferring the Naval ships to the provincial Naval Bases. Finally ending my "naval career" at Naval Station Holmen (Copenhagen) at the end of 1994, after almost 30 years of duty. Born in the center of Copenhagen back in 1948. 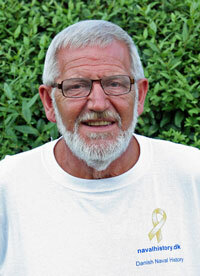 However, now living with my wife, Kirsten, in the small city of Havnsø in the north western part of Zealand. 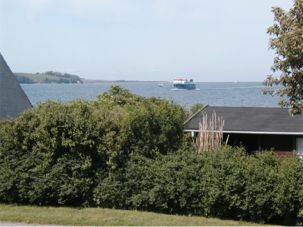 From the windows we have a clear view to the small island of Nekselø, the bay and the local yachting club, just great. We also have a glance view to the Naval Artillery Course, just to the direct north, and quite the bay is visited by naval vessels. playground for both our children, sons-in-law and daughters-in-law, and an increasing number of grand childrens. Your contribution to the improvement of this website is most welcome. You can contribute by sending a story or signing the Guest Book or just using the Naval History Web Forum on this site. Anyhow, feel free to email me at any time. in the commanders cabin on board the frigate JYLLAND.